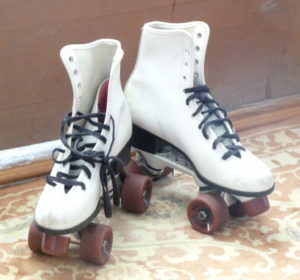 She loosens up the laces on her skates. An Air Force boy does figure-eights. And at her feet, rolls to a stop. She’s sorry, but she must be on her way. She’s only been an Oklahoma girl. He takes her halfway round the world. He keeps a fleet of fighter planes in flight. She takes dictation, and she types. Now, the years are going faster than they come. Turned in his wings. Raised up a son. She never hears her man complain. Three days a week, he’s tied to a machine. She tells him while she waits behind the screen. A candle burns. She’s sitting by herself. Stares at a face upon on the shelf. Rode with a boy she didn’t know. And somewhere, in the quiet of her mind.